-How long have you been natural? I've been natural about 12 years or so, and my hair is now hip length. I divide my hair in half, and wash it once a week. I just concentrate on cleaning the scalp only, never piling up my hair (I've found I break out too much if I just co-wash). Then I smooth a very light conditioner over all my hair and rinse that out, to help clean it and get all the shampoo out. After this I put in two giant heaping handfuls of a heavy conditioner (that isn't sticky or crunchy when they dry), one on each side of my hair. I don't towel dry. I brush my hair with a Denman brush, with the conditioner in it, small section by section. After I finish brushing a section, I smooth each curl between my fingers. It sounds time consuming, but it only takes a few extra moments, and it defines each curl (plus my hair is too thick and tangly to just run my fingers through it). Then I let my hair air dry and don't touch it. When it's dry, I braid it up at night. In the morning I take it down, smooth a little water and a little conditioner over my hairline (which gets really fuzzy), any other fuzzy parts, and the ends, to refresh the curls. I never ever use heat and I never straighten it. In a pinch I may use a warm hair dryer, just on my roots, only about once a year or so. I never comb or brush my hair dry. If I want Big Hair, I finger comb my curls apart very gently. I don't use anything else on my hair. I used to be a product junkie, but now I just use shampoo and the two types of conditioners. -What is the one thing you'd tell a newbie to help her on her journey? Please be patient with your hair while it grows. When I was first growing out the relaxer (I wasn't brave enough to do a big chop, I grew out my natural hair first), I got a huge, thick mat at my hairline. I was so afraid that was my natural hair and that my real hair would be one tight mat when it grew out. But I had faith, and kept letting it grow. It turns out the mat was just where my healthy curls were attached to the broken chemical hair. 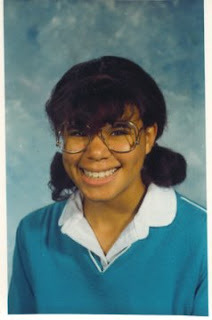 Over time, the mat inched down my hair until I cut off all that chemical junk when my real hair was about 8 inches long. I was so amazed when I first discovered what my real hair was actually like. 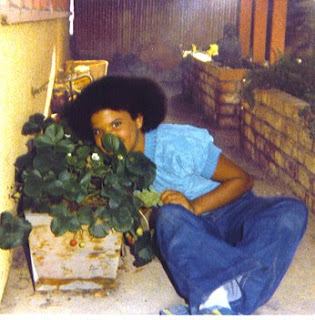 I'd never seen my natural hair before--it had been permed since I was a child. It was like the blinders dropped from my eyes when I first felt my real hair. It was then I realized it was the harsh chemicals I'd been putting into it that made it feel stiff and crunchy. -How do you maintain length? The most important thing to maintaining length for me is to never ever do anything to damage my hair. Each strand of my hair is very fine, and falls apart if I do anything that hurts it. I found this out the hard way by trying to wear a perm for over 20 years and saw my hair constantly breaking apart. It never could grow past my shoulders. I saw other people who were able to grow their hair long with a relaxer (like my mom, who grew her relaxed hair down her back), so I though I could do it too. I couldn't. Also, since I'm not damaging my hair, I don't need to trim it, so I keep all the length that comes in. -What's the best thing about being naturally glamorous?! Wow...everything! I tell people that when I made peace with my hair, I made peace with myself. It's like finally facing something you'd been running from all your life, only to discover that when you finally embrace it, it gives you nothing but joy in return. I used to be so envious of people with long straight hair, and I tried to force my poor hair to be an imitation of their hair, and my hair fell apart and looked horrible instead. But now that I have embraced my natural hair, the very people I was once jealous of come up to me and say they wish they had my hair! I love that I can walk in the rain with no umbrella, and my hair looks even better afterwards. 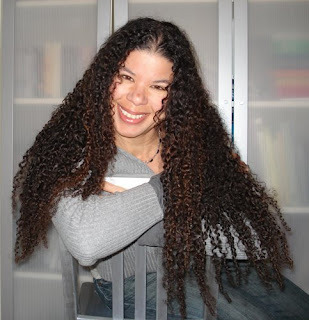 About BiracialHair.org and the book (which right now is tentatively called Curly Like Me): After hating my hair with a passion for most of my life, I discovered it was a combination of the chemicals and my lack of knowledge on how to care for it that made it act the way it did. I don't want anyone else with tightly curly hair to go through with their hair what I did with mine. When I first went natural, I didn't think my hair would grow much past my shoulders (being fed my whole life that very curly hair just doesn't grow long). It wasn't until my hair was past my waist that I realized it had been how I'd been taught to treat my hair that had kept it short. Making our curls happy is actually really simple, if only we know what to do with them--and it doesn't have to cost a fortune. I also wanted there to be more images of people with very curly hair that was also very long out there. Back in the day, it was the lack of images of very long, very curly hair that made me believe I could ever have hair past my waist (or even past my shoulders, for that matter). 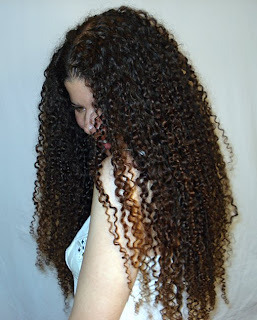 Curly hair is beautiful and joyful, and the more images we have of our striking curls, the more it will inspire others to put down those chemicals--or even stop a mom from putting those chemicals on her child's little curls. When I first created the site, I thought only biracial/mixed people would be able to use my information (since that's the kind of hair I have), so that's why I called the site "Biracial". I've since found that it can help most people so long as they have tight curls--so I want to make it clear that anyone is absolutely welcome! 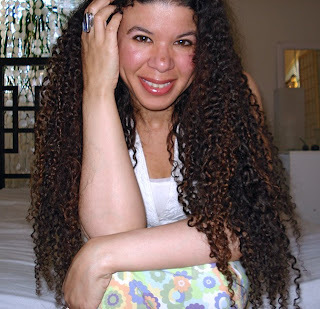 I am working on re-titling/ re-formatting the site (and book) so it's clear that it's for all types of tight curls. Want to see more of Teri? Check out her site! Teri I love your hair and your story is an inspiration to so many women! I look forward to your book. I love your hair! You inspire me to grow my curly hair long! Thank you so much maria and flerzty! I do firmly believe there needs to be more images of long, very curly hair. Until I grew mine, I didn't think it was possible that tight curls could get much past the shoulders. Thank you! I'm so glad to hear the techniques are working! Can't wait to hear how it dries. It dried just as pretty as it was wet, its shorter than it normally is but its def all curls defined curls which is way better than the frizz i had before, im def going to be using this routine from now on thank you teri !! Gorgeous hair. And you are rocking a straight afro in that first photo...that speaks to how versatile hair can be! I live in Brazil and have used Teri's method since July and it was the best thing which could have happened to my hair. I never thought my hair could become nice and little curls, it looked like a uncontrolled mass. I used to be a product junkie, always looking for the HG which would make my hair manageable. I am so thankful Teri shared her method. My biracial little girl has curly hair and i have just started to learn more about it! I tried your method and her hair became a miracle. i would like to send you pics of her new look! I love your hair, Teri! I've been using your method since January to grow out my natural hair after having a relaxer for nearly 7 years. I love all the little waves and coils I see growing. I get impatient doing my hair every week and waiting for length sometimes (and I often get tempted to hack off the rest of my relaxed hair), but your pictures inspire me to keep at it! I realize now that I spend much less time and money on my hair than I used to. I used to be a product junkie, but now I just enjoy experimenting with different brands of products. Thank you SO much for writing about your inspirational hair journey! Have you ever heard of Rhassoul Clay, and have you ever tried it?